There have been a handful of occasions in my life when I have stood before a work of art meaning to look at it, appraise it and have found myself drawn into it. In some strange way I become part of the work. It is as if my imagination has merged with the imaginative space of the art work and, at the same time, any mind-body split has been dissolved. I have, simultaneously, a visceral and imaginative response to the work – the heart rate increases, the stomach plunges – and yet I am strangely incorporeal. I am all mind, I am all sensation. It is a pure, original, all-consuming experience. The first time this happened I was standing in a large room at the old Tate in London the walls of which were covered with huge Rothkos. I was wrapped in Rothkos. Then, all of a sudden there were no edges and I was floating in these paintings and pounding with their rhythm and even more extraordinary I was filled with a type of knowing that, for someone with a strong intellectual bent, was staggeringly new. The second time, also in London, occurred at the Courtauld when for the very first time I saw the genius of Cézanne, saw the planes and shadings, saw the landscape through Cezanne; it changed the way I have looked at landscape – real landscape, in the world – ever since. The third occasion was coming face to face with Arthur Boyd’s ‘Nebuchadnezzar on fire falling over a waterfall’. I remember the shock of understanding when I saw that painting, the utter conviction that this was how life was – the beauty and the terror. The fourth time was walking through Kathy Temin’s large work ‘My Monument: White Forest’ (see the posting Imagination Soup: How novels begin). I was absorbed into this large installation so profoundly that I was transported back ten years to a visit I’d made to Auschwitz-Birkenau – one of the places, I would later discover, that had inspired this work of Temin’s. There was no prior knowledge here, no intention, rather my imagination and the imaginative space of the artwork merged. And it has just happened again. Today I saw ‘Absent Bodies’ by Chiharu Shiota (at Anna Schwarz Gallery, Melbourne, until 5th November). This beautiful art work, 15×4.5×4.5m takes up half the space of the gallery. It is a huge complex web, or rather webs constructed out of smooth red yarn. The obvious analogy is the network of neurons in the brain, the long axons, the ganglia where nerves meet, blown up to the size of a small house. But to reduce Shiota’s work to mere physical presence is to leach it of power, of effect. Shiota’s art work knows space, possesses space in the way, say, of the Grand Canyon or the open vistas of Antarctica or, indeed, the unfettered imagination. 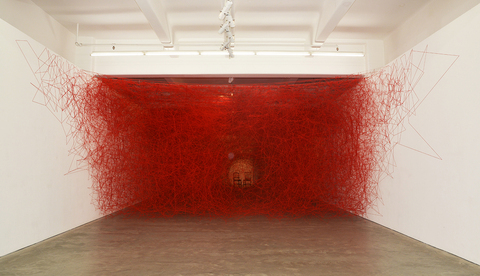 The tangle of red string creates an environment, and even though you stand at the edge you enter it (and yet physically you can’t enter it because the strings, criss-crossing in all directions, would stop you.) Again that sense of an imaginative space being coterminous with your imagination. Where the threads meet and cross one another, they are not knotted – there are no knots in this tangled environment – rather they twist around one another. And through the middle the threads thin out, may even disappear, creating a tunnel that leads to two chairs at the end; they are vacant, they are waiting for you. This is an environment of complexity and possibility, just like the imagination. It’s all about connection and space, creativity and insight. It is, truly, beautiful. And it opens a fourth dimension – not time, in fact time is stationary in this sort of unregulated experience – the dimension running along the consciousness-unconsciousness continuum releases the imagination itself, a numinous presence that simultaneously envelops depth and motion, memory and forgetting, experience and insight. This artwork becomes you. This entry was posted in Art, Imagination and tagged Anna Schwartz Gallery, Arthur Boyd, Chiharu Shiota, Kathy Temin, Rothko on October 9, 2016 by Andrea Goldsmith. In 1998, the National Gallery of Victoria mounted an exhibition titled, Beyond Belief – Modern Art and the Religious Imagination. The exhibition appealed to me not because of any strong religious beliefs of my own, but I was drawn (and continue to be so) by the pairing of different types of imagination, in this instance, the spiritual and the visual. I did not know which artists were to be included, but I understood from the advance publicity that many were well-known. The day I visited the exhibition there was quite a crowd. I was alone and in no hurry, so loitered beyond the outer edge of onlookers, waiting for the crowd to thin. And so it was that I walked around a screen and there, several metres away, I saw a small Rothko (it was Black, brown on maroon, 1957). My first response was delight at the unexpected meeting with one of my favourite artists, my second response even while the delight continued, was tears. 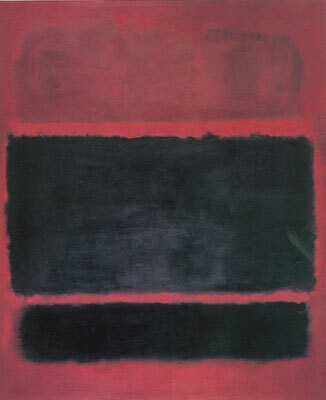 I stood there in an open space beyond the crowd gazing at this Rothko with tears rolling down my face. The painting affected me in a way I did not understand. But something profound HAD happened. If I say about the experience that I was moved (and I clearly was moved) it does not do justice to what was an intense and complex reaction. If I say that I was overwhelmed by intense emotion, it still gives little indication of what I was feeling at the time. There are certain experiences, intense and significant, for which common language usage all too often fails. The appreciation of music, for example, or the expression of pain, or a description of wonder, or my unexpected reaction to Rothko’s painting. More often than not the attempt to explicate, actually leeches the experience of its essence. So what happened when I caught sight of that Rothko hanging on the gallery wall? As to which metaphor I might use, that would depend both on my experience and the person to whom I was attempting to share it with. Gazing into the face of God might hit the spot with someone of a religious disposition, the Mahler metaphor with someone musical, natural world metaphors with those connected with the natural world. Too often we treat language as if it were arithmetic, wherein an equivalence is assumed/sought between symbol and referent. But as Magritte so aptly demonstrated in his Ceci n’est pas une pipe, language is not the thing. We might speak of the infinite nature of language, can actually show how it works in theory, but in practice, language usage is all too finite. We have nailed language to the mast of unambiguity. We have stripped it of its music. We have smoothed out its paint strokes. We have made words into Lego blocks. When language in this unambiguous and hobbled form is used to describe an experience like my Rothko experience, of course it fails, of course it falls short. So much of my Rothko experience was non-verbal, or extra-verbal, and only language that spills its usual boundaries will do the experience justice. We humans live in a language dictatorship. Like the Russian poets during the years of Stalin, we need to go underground. It’s not vocabulary we are wanting (although the impoverished vocabularies of most of us could do with considerable expansion), rather we need to bring imagination to language usage, we need to impregnate our language with tone and texture and sensation and atmosphere. Of all the tools of language and communication it is metaphor that subverts the whole notion of sign-symbol equivalence, that smashes the ties of immutability between language and its referents. Metaphor is the wild child of language, the recalcitrant offspring which can turn around and teach its elders what they did not realise they did not know. Metaphor makes the familiar strange and different. Metaphor brings music to language, it brings sensation and emotion. Metaphor subverts routine ways of seeing and thinking and communicating, and thereby it illuminates the shadows of meaning. The right metaphor can portray complex emotional and intellectual responses with great power and economy – which is why poetry, good poetry, can have such a profound effect, and bad poetry, of which there is an inordinate amount, feels like such a betrayal. But in fact prosaic and routine language usage is no less a betrayal. If an artist were to restrict his palate to green, if a composer were to confine herself to a single octave, we would feel betrayed. So, too with banal and hackneyed language usage. It’s treating the great gift of language in cavalier fashion, it is also denying what marks we humans off from other animals: language and the imagination. And why be concerned about this now? Public language as seen in the two second rehearsed grabs of our politicians, as seen in the mindless talking in exclamation marks of comperes of reality TV shows, has never been so impoverished. If we don’t act soon we will lack the language to describe what has gone wrong, much less fix the situation. This entry was posted in Art, Language, Metaphor and tagged metaphor, Rothko on June 16, 2014 by Andrea Goldsmith.